Three weeks ago, BTT was contacted by a group of concerned anglers regarding a development site in Tarpon Springs, FL that was inhabited by tarpon of all sizes. Most of these anglers had been fishing there for years, even decades. The water was being drained rapidly, which meant we had to act fast. After a few phone calls, we were able to contact the developer and their client to get permission to access the property and the Florida Fish and Wildlife Conservation Commission (FWC) issued us a permit to relocate the fish. After a grueling day of seining and cast-netting in the waist-deep mud and silt, we were able to relocate over 60 tarpon ranging from 12 to 40 inches. A huge success! This is not a typical practice for BTT, but it was an opportunity we couldn’t pass up. Our studies in Southwest Florida are finding that tarpon in degraded habitats like these exhibit poor growth rates and can sometimes get trapped in these types of habitats that are hard to emigrate from once they get bigger. We are also finding that the majority of juvenile tarpon sites reported to us through our Juvenile Tarpon Habitat Mapping Project are in degraded habitats (golf course ponds, residential communities, mosquito impoundments). The misconception is that because tarpon are there, it must be good habitat. This is not always the case and does not bode well for the future of the tarpon fishery. 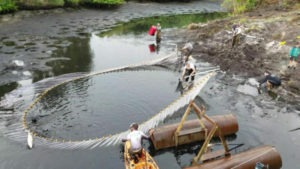 This particular site had already been developed into a mobile home park, and with a lengthy culvert connection from the Gulf, could have trapped these tarpon for years. Relocation was the best chance for these fish to join the tarpon population. We are very grateful for the site supervisor’s constant communication and encouragement during this project. Because of the thick mud, we relied on the pumps to lower the water level so that we could more easily access the fish. A huge thanks to the anglers that have been watching this site for years and took immediate action. This would not have happened without your persistence and compassion. We’d also like to thank FWC for their swift action and the Suncoast Youth Conservation Center for use of their seine net. See more from BT&T at www.bonefishtarpontrust.org. This entry was posted in Fishing Tackle on September 17, 2018 by ronniegarrison.